THE advantages to be obtained from flying bombs are self-evident and the various nations of the world have been trying to develop these mechanically controlled, death dealing planes for the past many years. Every so often an article appears in a newspaper which indicates that France, England, Italy, or some other country has perfected an airplane which takes off, flies through the air for an appreciable time and lands without human hands touching either the airplane or engine controls. 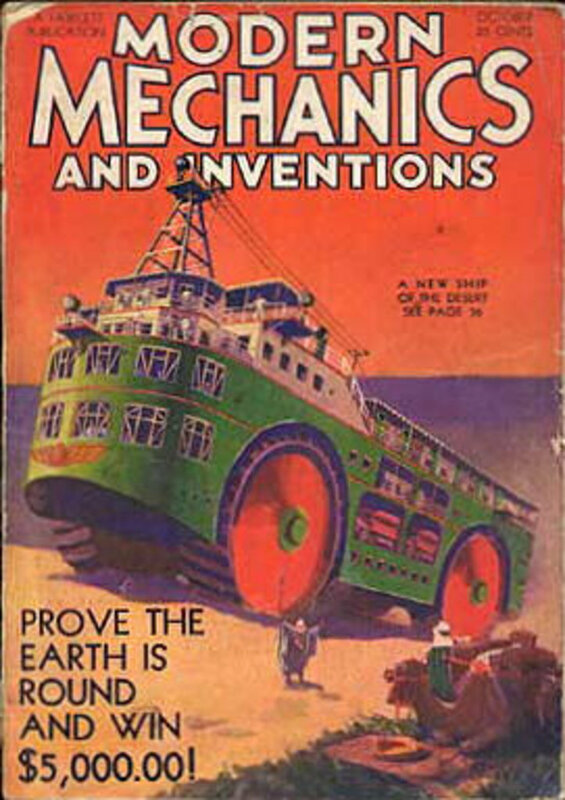 The average person when he reads of these mechanical marvels thinks in terms of transports for carrying pay loads and perhaps the commercial companies will find use for them but behind the screen of secrecy is always the thought that such devices would be of untold value as military weapons. In general flying bombs are of two types; the radio controlled and the mechanically controlled. The radio controlled bombs can again be divided into two classes; those that ride a radio beam from the point of take-off to the target and those that are guided through the air by a directing plane. Flying bombs are nothing more or less than small airplanes. The size of the device varies with the load of explosive to be carried and the distance to be covered. In all cases provisions are made for the bomb to go into a dive when it reaches the target. In the bombs which ride a radio beam, the beam is directed toward the target and the planes launched as fast as they can clear the take-off platform. 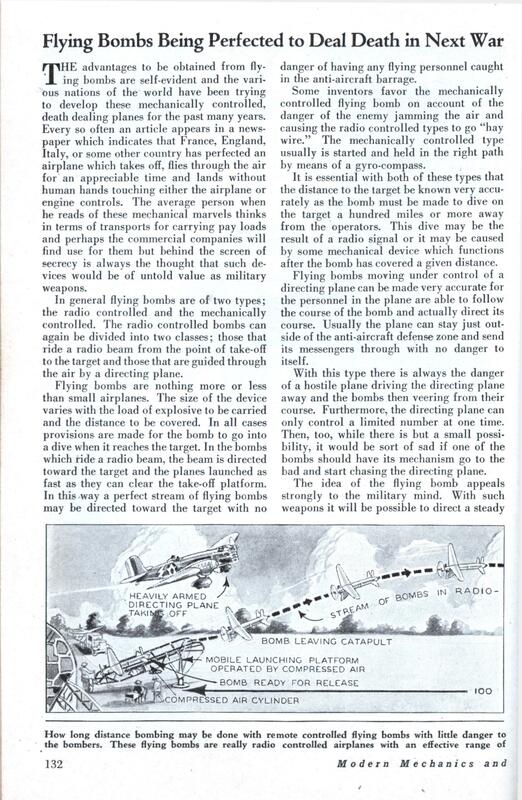 In this way a perfect stream of flying bombs may be directed toward the target with no danger of having any flying personnel caught in the anti-aircraft barrage. Some inventors favor the mechanically controlled flying bomb on account of the danger of the enemy jamming the air and causing the radio controlled types to go “hay wire.” The mechanically controlled type usually is started and held in the right path by means of a gyro-compass. It is essential with both of these types that the distance to the target be known very accurately as the bomb must be made to dive on the target a hundred miles or more away from the operators. This dive may be the result of a radio signal or it may be caused by some mechanical device which functions after the bomb has covered a given distance. Flying bombs moving under control of a directing plane can be made very accurate for the personnel in the plane are able to follow the course of the bomb and actually direct its course. Usually the plane can stay just outside of the anti-aircraft defense zone and send its messengers through with no danger to itself. With this type there is always the danger of a hostile plane driving the directing plane away and the bombs then veering from their course. Furthermore, the directing plane can only control a limited number at one time. Then, too, while there is but a small possibility, it would be sort of sad if one of the bombs should have its mechanism go to the bad and start chasing the directing plane. The idea of the flying bomb appeals strongly to the military mind. With such weapons it will be possible to direct a steady stream of planes each carrying 200 pounds or more of explosive against an enemy concentration camp, munition dump or other military establishment. The hostile aircraft can shoot them down if they so desire but the resulting explosions will make other hostile airmen a trifle more cautious. Anti-aircraft batteries can knock them from the skies but scores of others will take the place of those knocked down. Somewhere out of the danger area there will be an airman who will watch these flying messengers of death as they dive to the earth and who will send back data by which the ground force some hundred miles away will send more bombs out with corrected settings to secure hits instead of misses. Such a method of fighting leaves but one course open to the troops at the receiving end, abandon the area under fire with a minimum delay. It even looks a bit like a Predator. these things just take a few years to mature.